I’m no expert on Detroit soul. I’ve only been to the city once and it was far too short of a trip to even begin to get into the real stuff. 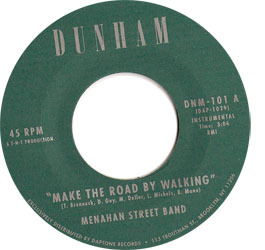 Still, I find that most of my favorite 45s were pressed in the Motor City, proving that the city’s second biggest export are dope musical gems. I won’t pretend to know anything about this group because there really isn’t much to know. Most groups on small Detroit labels had short local success and then faded into obscurity as Motown rose to national prominence. Singed to the tiny Dynamics label, The Superlatives were no exception. What is exceptional about The Superlatives (aside from their fantastic name) is this track, which was their most popular. Crisp drums, a deep base line, blinging vibes and bright horns are the perfect backdrop for the groups smooth doo-wop vocals. 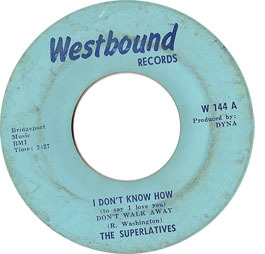 The track was later picked up and distributed by Westbound which might explain why The Superlatives didn’t completely disappear into Detroit soul history. 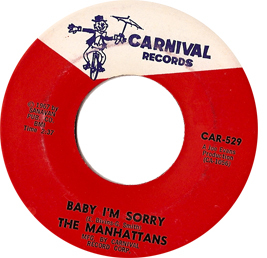 Ironically, the Manhattans weren’t from Manhattan at all. They were from across the Hudson in Jersey City. The quintet-George Smith, Edward Bivins, Winfred Lovett, Kenny Kelley, and Richard Taylor-met after serving in the military and would form their group in 1964, after being discharged from service. 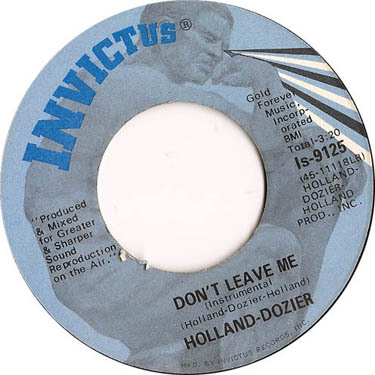 This track was recorded during their early career at Carnival and is a shinning example of the groups writing genius (most of their songs were written by various members of the group). Not to mention the lovely tension between soulful vocals and the a funky footed rhythm section that drives this track hard. One of my favorites. Enjoy. Can’t Stay Away. . . It is a fact that Curtist Mayfield was a monstrous force in the black music scene, shaping the inner city sound of black America in the 60′s and 70′s (and in many ways the sounds that would later come out of those neighborhoods). Very few musicians of the time were as prolific, with Mayfield owning not one, but two independent labels. His better known Curtom Records was the label which he would produce his own records under, including his work with the Impressions, The Staple Singers, and his blaxploitation classic Superfly. But few either remember or know about his works on Mayfield Records. The Fascinations were one of the groups on Mayfield Records. Although they never rose to nation-wide fame, the Fascinations were a local favorite of the windy city. Their 1967 single “Say it Ain’t So,” brought them some regional love, but unfortunately they never translated that success to the larger market. Still, their short recording career with Curtis produced some sweet soulful gems, “I Can’t Stay Away from You,” being one of them. While they would ultimately become a footnote in the larger story of Curtis Mayfield’s career, the is no denying that these sisters had soul. Pardon the scratchiness as we truly had to dig deep for this one. Special thank you to TNT for hipping me to this beautiful track. Here’s to unearthed gems. My first introduction to Hugh Masekela was a few years ago when I stumbled on his book while doing research for an article. I was actually skimming through his auto biography looking for specific information on the musician I was researching, only to be disappointed and find very little worth the time. So, I flipped to the beginning and started to read his story. After reading the biography, I was baffled at how, in my obsessive and compulsive obsession with records, I had managed never to buy a Masekela record. . .so I went out and bought this 45. Sadly, I didn’t learn my lesson. The 45 found it’s way to the bottom of my queue and it laid there neglected for about six months. Until one evening, while I was over a friends house for dinner, he played the track. As soon as I got home, I dug it up and played it late into the night. What struck me about the 45 is that Masekela, with grace and charm, tells stories through his music. Narrative of growing up in apartheid South Africa, of losing his way, of finding success, and of transforming and rebuilding his country through music are communicated in his playing. Yes, this all sounds hokey, but it’s hard to deny the presence of these themes in his music. 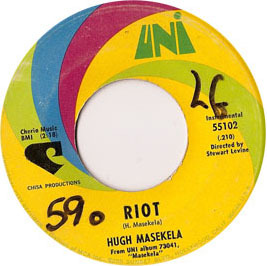 “Riot,” is one of his tracks that does it especially well; so many stories are conveyed in this short (but sweet) track. I could go on, but sometimes you just need to listen. 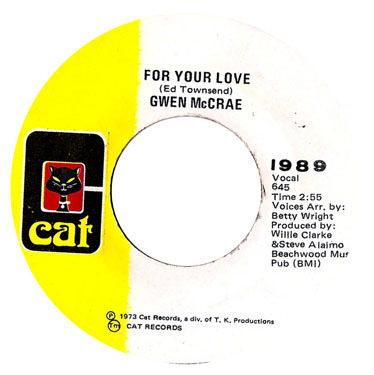 . .
One of my favorites from the very talent Mrs. McCrae, this track is off her hit record Rockin’ Chair. McCrae earned her chops as a child singing on Sundays in her Pentecostal church. As a teenager, she was hipped to singers like Sam Cook and Aretha Franklin and was soon singing in local clubs in her home town of Pensacola , FL. Betty Wright would later discover Gwen which opened doors and gave her the opportunity to work with [song] writing duo Clarence Reid and William Clark. This track is probably one of four singles released before the full length album. Vocal arrangements were done by no other than Betty Wright and the track was produced by Willie Clark making this one a heavy hitter. While McCrae is better know for the hit “90% of Me is You,” this track is more soulful and less funky, giving it a softer touch and making it more of a love jam; perfect for your mac game. Enjoy. This smooth jam is a new addition to the 45 collection. Since I picked it up two days ago I haven’t been able to get it out of my head-not unlike the song suggests- and so I thought it a good place to start this blog off. This space is an adventure into two things: one, a new blogging venue and two, a new focus on my record collection. I’ve recently been focusing on expanding my 45 collection and this space will hopefully help me process some of my new acquisitions, learn a thing or two about my records, and share good music. I’ll say it from the start: this isn’t a showcase of super rare or super obscure 45s. It’s not about that. It’s about sharing good music. A friend recently asked me to send some cool tracks her way and I realized it wasn’t possible, because most of what I’ve been rocking to have been new 45′s I’ve been finding. So this, if anything, is a place to share that music. 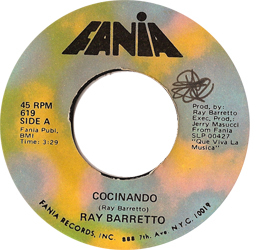 This 45 comes from Chicago and was very graciously given to me by a new friend who has a refined ear for northern funk and northern soul. 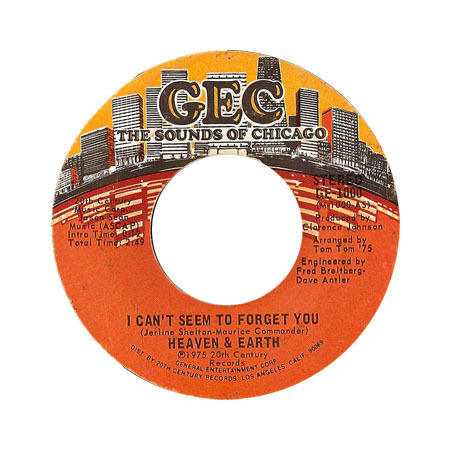 This Heaven & Earth track is off there first album on GEC and has the original group that consisted of brothers Dwight Dukes and James Duke, Keith Steward, and Michael Brown. Vocally gifted, the original four had soulful harmony on par with The Stylistics and are backed on this track by the funky arrangements of Chicago resident soul wizards Tom Tom 84. There’s not much more to say. The track rocks for itself. Listen, get hooked, and don’t forget it.